Ever since it launched in 2010, DreamWorks ' How to Train Your Dragon has been a massive success, both critically and at the box office. The two films have grossed over $1.1B and earned three Oscar nominations, while spawning the long-running DreamWorks Dragons TV series and a bunch of video games. It had been unclear if the third film would be a simple continuation of Hiccup and Toothless' story of if franchise director Dean DeBlois had a conclusion in mind, but now in an interview with EW he has made it clear that this is the end of everything, both on the big and small screen. Titled How to Train Your Dragon: The Hidden World, it finds an older, wiser Hiccup now leaving in peace as the leader of his people. Meanwhile, his dragon pal Toothless' encounter with an untamed female mate leads to the discovery of other dragons just like him. 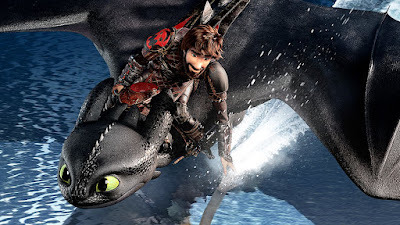 Hiccup and Toothless must face the possibility of a future apart from one another, even as danger threatens their kind. How to Train Your Dragon: The Hidden World opens March 1st 2019.